How do I work with permissions and visibility? Many times making collections shared with the entire organization is good practice. It might for example be a good idea to let everyone in your organization access the overview collections and teams' collections for transparency purposes. Depending on the size of your company, you might also want to share office information, vacation planning, and your company roadmap with everyone internally. However, if only a few people are working together on a small project which doesn't affect everyone in the organization, it might be better to make the collection private and only invite the members that are involved in the project. Other information that you wish to share with everyone externally, such as a public roadmaps or press releases can be kept in a public collection since it is visible to anyone with the link. Like visibility, you’re also able to choose who should have owner rights for each collection. 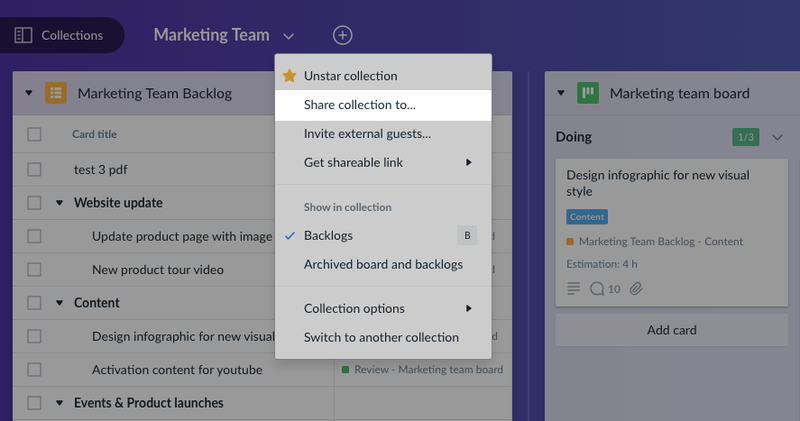 Being the owner of a collection means that you can manage members, invite external guests and configure all boards and backlogs in the collection. The owner can also change the settings for the collection itself, including renaming, archiving and deleting it. This can come handy since it's a quicker way of giving one person, such as a manager of a team, owner rights to all boards and backlogs within their team's collection at once. The owner can then autonomously manage the collection and make sure it stays organized. By clicking Share collection to... from the Collection menu you can get an overview of all members in the collection. This is where you change the visibility settings as well as permissions. If you are an administrator of an organization, you can take ownership of collections. This is done from the collections menu, accessible via the collection name. For every individual board and backlog the owner (creator) can choose if members should be able to configure it. 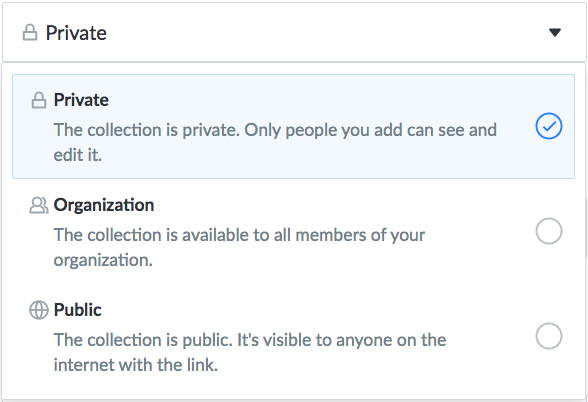 When these permissions are disabled, members will not be able to rename, archive, delete or move the board or backlog to another collection. This reduces the risk that items get accidentally edited or deleted. You can also decide whether members and guests should be able to add and edit cards. To change these permissions, go to the menu (⋮) of the board or backlog, then click More and then Permissions. In the pop-up you'll be able to enable and disable permissions for members and guests. 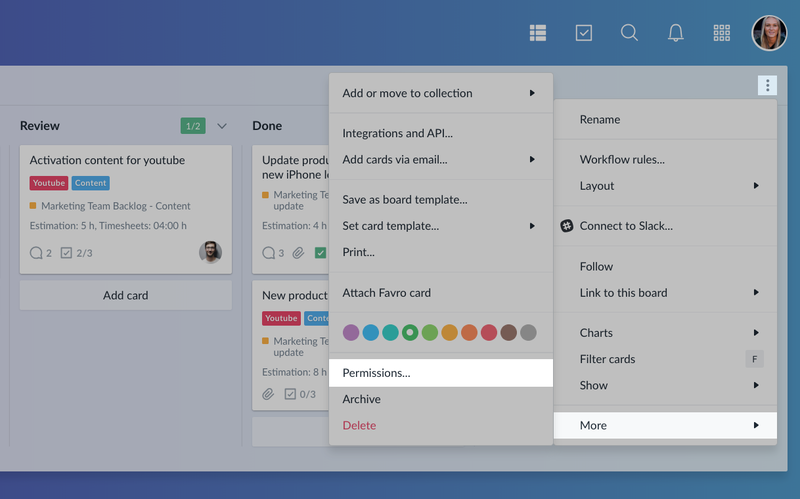 On a higher lever, administrators can edit the permissions for the entire organization. 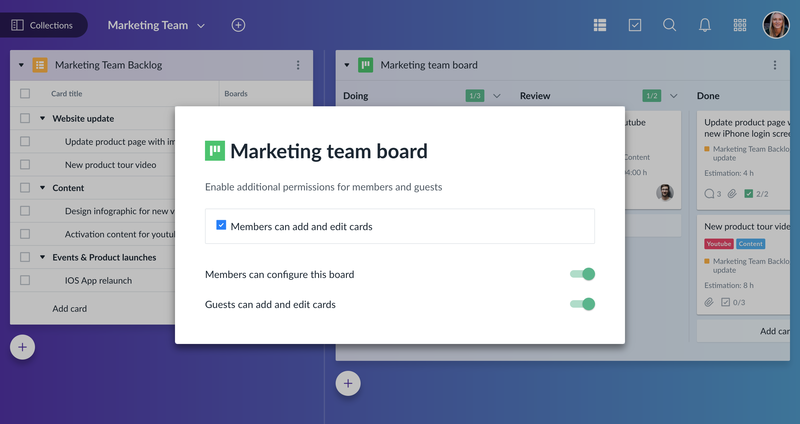 Clicking Administration in your avatar menu and then Settings on the left side menu, you have the option to give your members the permission to invite guest users, enable integrations, create groups, and make collections public. Now that you have clear permissions and a good structure set up, it is time to get the rest of the organization on board. Read this article for information about how to help your colleagues find your team.